Many people will agree that Morton’s Steakhouse is one of the best steakhouse in Singapore, and I know what you are thinking, Morton’s Steakhouse — the burger? Are you sure about that? 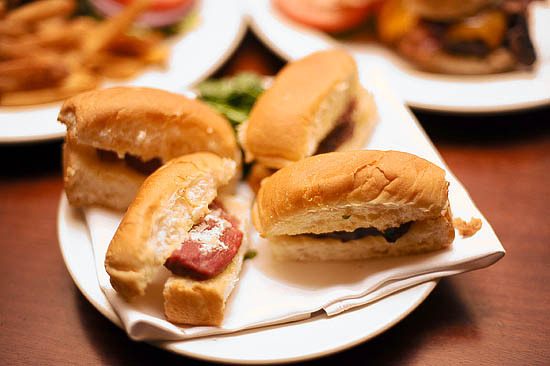 The Morton’s Bar has always been known for their weekday happy hour during 5pm – 7pm where there’s free-flow steak sandwich with every order of martini. Just in case you are confused, the Morton’s Burger is available at the Bar (not inside the Steakhouse), from 8pm – 11pm for $25 $30 (usual price $30 $35). *they have recently increased prices. I am a superficial guy. When it comes to burger, size does matters! The Morton’s USDA Prime Burger in every aspect, was like the perfect burger. Within the softly toasted bun with freckles of sesame, was a huge beef patty that’s firm and juicy and extremely satisfying. While it didn’t exactly had the melt-in-mouth-effect, the beef patty was pretty close in replicating the religious experience. The additional cheese and topping completed the making of the perfect burger. I love a good cheesy cheeseburger. You know, a burger just isn’t complete without cheese, and at Morton’s bar, there’s swiss, crumbled blue or cheddar cheese to choose from. 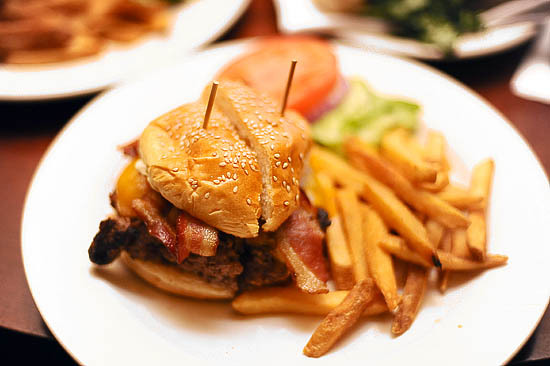 Other than the cheese, each burger gets a separate topping in the form of of either crisp bacon, sauteed mushrooms or onions, served with French fries. I wasn’t sure if I should write about the fries since it’s a very ordinary side found on the plates of almost every western food. But good things are meant to be shared, and you must believe me — the fries were really good! The Four Petite Filet Mignon Sandwiches ($20) pales in comparison to the Morton’s USDA Prime Burger, but that’s not to say that it wasn’t good. With a generous chunk of beef fillet sandwiched in between the bread, it was a good appetizer to kick-start our palate for the best burger in Singapore. // Edited: They have recently increased the prices to $30 (after 8pm) for the burger. I’m not sure if I will pay $30++ for a burger, but you may want to try it out at least once. Twenty five bucks (before taxes) isn’t cheap for a burger, but considering that there are plenty of mediocre burgers that are going for twenty bucks, I’d gladly pay a little more for this wholesome combination. My dear friend, this is the best burger in Singapore. To quote mike, it felt like we just swallowed a cinder-block after eating the Morton’s cheeseburger, but we would do it again in a heartbeat. ahhh. =( I will definitely go there when I’m back in Dec! Free flow steak sandwich with every martini ordered? Man you have such a blog backlog! This was like 3 weeks ago Almost time for another visit for Singapore’s best burger – glad to see you and I are of the same mind on this one! When/Where is the next feasting!??! Yes, go earlier at 5pm on a weeknight for the free flow steak sandwiches. And the BEST martinis in town. Was hoping you didn’t give away the best secret in town – Friday nights are packed as it is!! Christel: hahaha it’s one of the best burger in Singapore! mike: thanks for the introduction to the best burger in Singapore dude! where u wanna check out next? mr. lee: glad you asked this. Well, both can be considered as the ‘best burger in Singapore‘ to me. But price wise, it’s really very different. You can get almost 3 Smokinn frogz burger for every 1 morton’s burger. But having said that, the size of a Morton’s burger is huge, probably 1.5 times of the smoking frogz’s version. It’s really difficult to say which is the best burger in Singapore, but given that smokinn frogz’s burger is 12 nett, i’d say it’s the best value for money burger, while Morton’s is among one of the best burger in terms of size and taste.